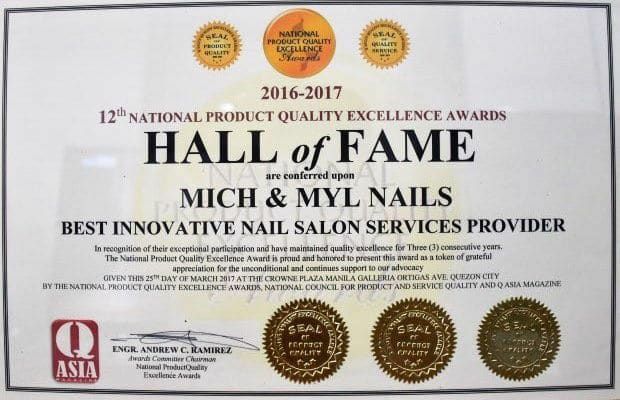 Mich & Myl Nails Hall of Fame Awards – Best Innovative Nail Salon Salon Provider 2016 – 2017. Recognition for the exceptional participation and have maintained quality excellence for three consecutive years. Given on the 25th day of March 2017 at the Crowne Plaza Manila Galleria Ortigas Avenue, Quezon City by the National Product Quality Excellence Awards, National Council for Product and Service Quality and Q Asia Magazine.